“I’m repulsed,” said Donny Deutsch to Matt Lauer. “I mean, I hope that he doesn’t get more viewers as a result of this. This guy is like a — you see what he looks like, he looks like a weenie,” said Deutsch. 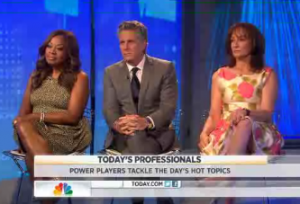 “Could you be more inappropriate on Memorial Day?” asked Star Jones rhetorically.